This post was made in the fall, but technical issues delayed the implementation. We’re now ready to move forward. Recently, we at the Helpdesk have spoken with many individuals who were disappointed with the interface and performance of NetStorage, but were unaware of other, usually superior ways to access their files. In an effort to improve awareness, and in consultation with Central Systems and Network Services, we will be changing the go/middfiles shortcut, currently pointed directly to Netstorage, to lead to our main documentation about Middfiles. Using this documentation, users should be able to quickly connect using faster, better methods and be on their way. We realize that this will be a significant change for some in our community, but we anticipate that over time, this will help people distinguish between Middfiles, the server system, and Netstorage, a web application that permits limited access to that system and is not intended for daily use. Netstorage will still be accessible via go/netstorage for edge cases like mobile devices that cannot use WebDAV. The plan is to make the switch within the next few weeks. (EDIT: The changes have been made.) This post (available at go/middfileschange) will be updated with any new information. As always, we invite your feedback via comments. For specific questions or issues, please make a ticket. This entry was posted in Helpdesk Alerts, LIS Staff Interest, Middlebury Community Interest, Post for MiddNotes, Post for MiddPoints and tagged go, middfiles on April 3, 2014 by Zachary Schuetz. As always, we invite your feedback via comments. The current plan is to make the switch early next week. [ETA: This has been postponed pending a server update that should improve performance, especially with OSX 10.9.] If you have questions or need help, please feel free to call, click, or visit us anytime. This entry was posted in LIS Staff Interest, Middlebury Community Interest, Post for MiddNotes, Post for MiddPoints and tagged go, middfiles on October 25, 2013 by Zachary Schuetz. 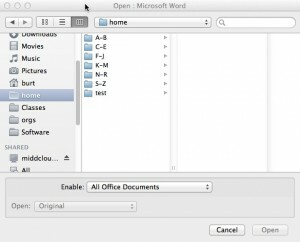 – In June, for four hours, anyone could access anyone else’s Dropbox files. – Three other separate security flaws (or holes) were found this summer. – Furthermore, FTC found that Dropbox was misrepresenting their security measures and protocols. – In addition, Dropbox had changed then clarified its Terms of Service within a matter of days. 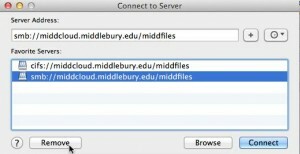 This entry was posted in LIS Staff Interest, Middlebury Community Interest and tagged backup, data storage, Facebook, middfiles, security on August 17, 2011 by Petar Mitrevski.